Internet security jobs are set to grow by a staggering 28 percent by 2026 amid an estimated $6.3 billion in cybersecurity breaches. 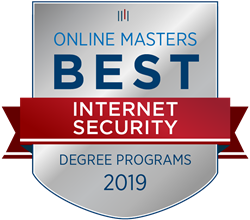 OnlineMasters.com, an industry-leading educational research organization, announces the release of their Best Online Master's in Internet Security Programs for 2019. They have identified the top programs in the nation that are the best in the areas of curriculum quality, program flexibility, affordability, and graduate outcomes. Leveraging an exclusive data set comprised of interviews and surveys from current students and alumni in addition to insights gained from human resource professionals; every online degree program was analyzed with only the top 28 making it to the final 2019 list. The methodology incorporates the most recent data from the Integrated Postsecondary Education Data System (IPEDS) and statistical data from the National Center for Education Statistics. Most importantly, only programs from accredited nonprofit institutions were eligible. OnlineMasters.com provides proprietary and unbiased research to help students discover their options for the best graduate programs. The organization aims to inspire students to think big and make an impact in society through the pursuit of higher education. With user-friendly guides and hundreds of program rankings, OnlineMasters.com enables students to make informed decisions about earning a master’s degree online.